A fun game with a unique mechanic. Quick to pick up but there isn't much depth so it is currently only fun for one playthrough. I was a little bit confused about the objective at first, but once I got the handle of it, it's so much fun hahaha. Love watching my cute donuts army flipping around! Love the atmosphere and donut-based Katamari Damacy. Would be cool to see that expanded into a bigger world. 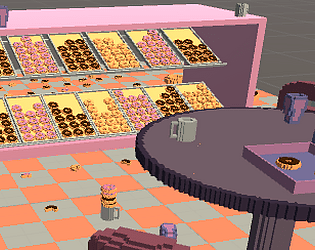 Updated donuts to be more aggressive, and a secret ending? Also some sound fixes and finally fixed the video link. I definitely want to see this further developed. I love the sound effects and the art and the weirdness of the controls. I could just sit around and push and pull donuts for quite a long time. Who would have thought pulling donuts around would be so fun??! Great little game. The video is not the game.